Here are three tapestries that I have recently completed. I am exploring different setts with different number of weft strands. No conclusion yet. Well here is another project I have been working on for the last month or so. I can't yet say exactly what it is yet...but it is another take on a maze. The cartoon took many weeks to figure out. The warping of the loom was a nightmare. 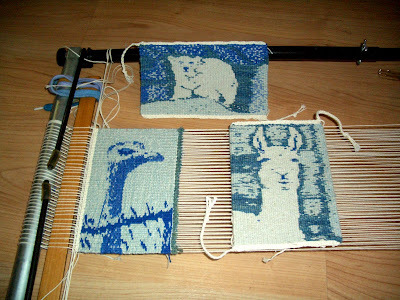 I think the weaving should be quite easy. Why was the warping so bad? I think I will blame the Tour de France. You see I love to weave and watch the Tour de France on TV. It comes on about 5:30 am on the west coast. Then it is played again around 8:30 and again later. I can weave and weave and weave and never get tired of it. So much better than books on tape. And this time, the pictures of the flat areas looked just like like Van Gogh landscapes. I had nothing to weave while watching the Tour. So I decided to warp my 16H loom for a piece that I want to enter into Small Expressions next year. There is no table in the den big enough for the loom so I had to move a new one in. The table was round and of a slightly different height and size than I am used to. Plus, it was a bit awkward getting the threads through the reed and the heddles. I have never made as many mistakes as I did on this piece. There were only 310 ends which needed to be sleyed and warped. At 48 epi that only a bit over 6 inches wide. Now I admit I was using serger thread which is thin...but on the positive side it was turquoise blue...a lovely color and a nice contrast with the white plastic heddles. I think I must have touched each end at least twice and some I fixed several times. 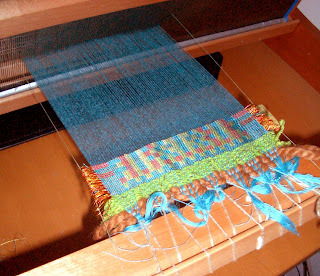 After three days, I moved the loom back to its assigned work area and finished up the warping in a day or so.